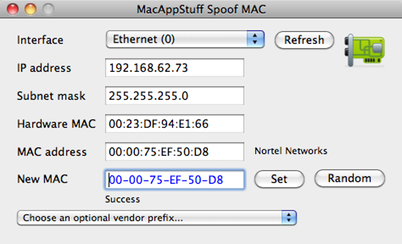 Change your network card’s MAC address (ethernet), effectively spoofing your identity. Choose a random address, create your own address, or create an address based on a vendor’s ID. Application can start with your Mac, so you can change the MAC address each time you begin using your Mac. Also shows you your IP address, sub-net mask address and hardware MAC address.